Today is late actor Heath Ledger's birthday. 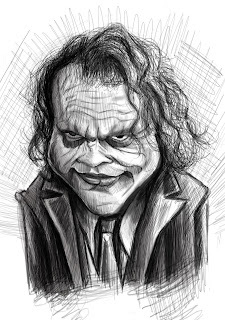 To celebrate i wanted to do a quick caricature sketch of him in his greatest role as the "joker" from The Dark Knight. I just did this for practice and it ended up taking way longer than i thought it would. somewhere around 2 1/2 hours or so. i kinda like how it turned out out so i may paint it one day. anyway, happy birthday Heath, RIP, and im going back to do more sketching.